Organizing the Generation Games is really quite easy. You can do it yourself! So no worries. This user’s guide will give practical information and explains the 7 steps to take. Tip 1: the user’s guide describes several ‘steps’. This does not mean you need to finish one step before you move on to the next. You can work on several steps at the same time. That’s also because the elements are interrelated, like the size of event location, number of sports, number of participants. So you can switch from one step to another, back and forth, developing your event plan. Tip 2: we are here to support: it’s our pleasure to help you in setting up an edition. This website provides much information (User’s Guide, Questions & Answers, experiences by local coordinators in other cities). We fully understand, you still have questions. Please send us an email at any time! We are here to support: it’s our pleasure to help you in setting up an edition. We fully understand if, you still have questions. Please contact us. THE GENERATION GAMES IS SO MUCH FUN AND SO GOOD! Okay, let’s get started! First, it’s good to make an estimate of the scale of your edition. For example, to have a first idea of the number of participants you are aiming for. Depending on scale and ambition, you will probably need some kind of formal support and ‘green light’ by the city officials. 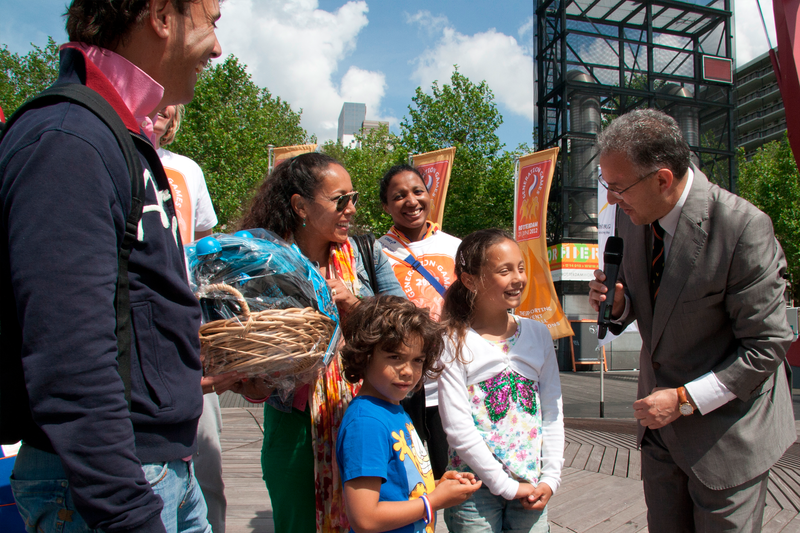 Invite your Mayor to play a role in the event, like during the opening ceremony! Perhaps together with an Olympian, to officially kick-off the event. Each city decides on the scale and ambition. Any scale is fine! Is about 500 participants your target? Sounds good! 2,000? Great as well! You probably know best for the local situation which ambition is realistic, and what you can handle. 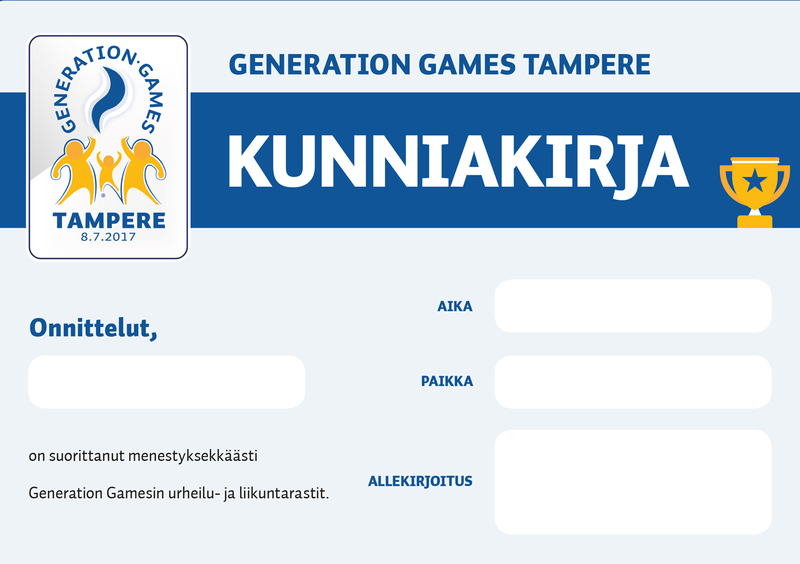 For a one-day edition of the Generation Games, 1,000 participants would be good, if you offer around 10-15 sports. It’s good to inform and involve the local authorities. Like the sports department or events department. You know best who to involve. Especially when using a public space in the city: you probably need some permission, a green light, a formal ‘go’. Good to know: the Generation Games does not cause traffic jams and streets being blocked. The small teams of around 4 persons walk through the city. It’s not a big running or cycling event in the middle of the street, having major traffic implications. So, a permit by the city should not be a problem! 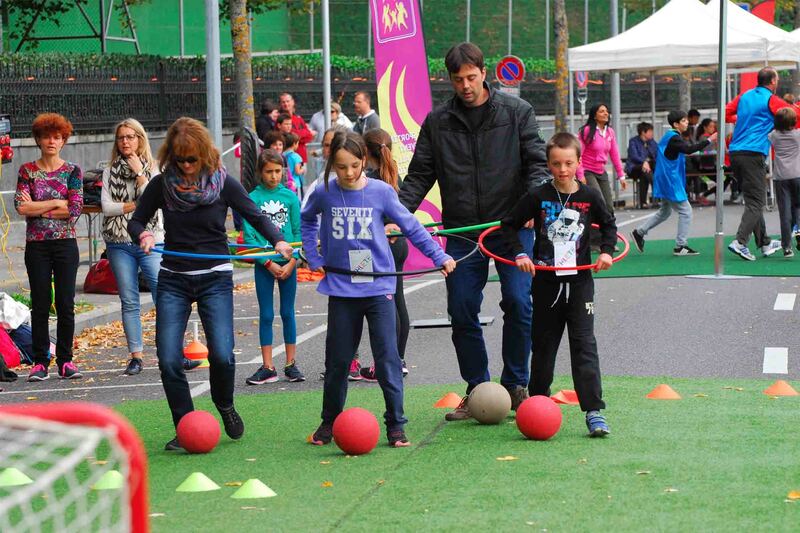 TIP: connect the Generation Games with certain policies in your city: for instance, on healthy lifestyle, on tackling ageism, on inclusive society. And involve the relevant institutions and departments. 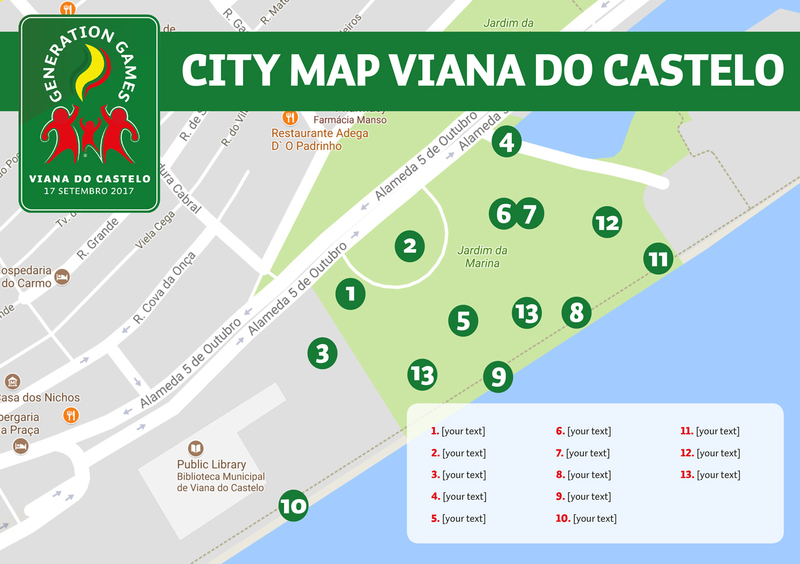 The event can contribute to certain objectives in the city, in several fields. 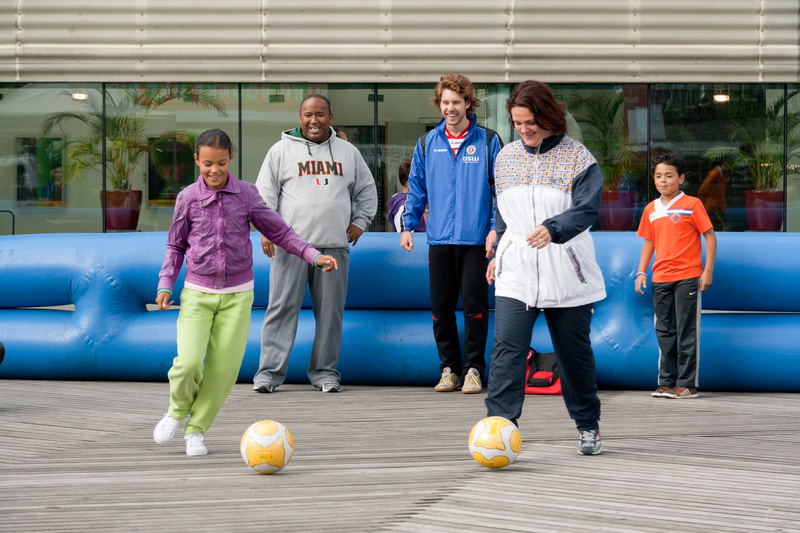 The Generation Games is inclusive: participants of all ages, abilities, backgrounds taking part. Please make sure these and other principles are part of your edition. TIP: during the process, please share your project plan with us, keep us informed. Our pleasure to give feedback. It’s good to start with a first sketch of a script for the event. About financing your edition: it’s more about ‘realizing’ than ‘financing’ the event. Many partners can contribute to the success of the event. With materials, expertise, people, enthusiasm. Please also see under 5. COORDINATION & PARTNERS and in the Questions & Answers section. During the process, please share your project plan with us, keep us informed. Our pleasure to give feedback! Please contact us when you consider to organize an edition. We keep track of all the editions. So, it’s good that you have some idea of scale and ambition. Along the way, during the preparation process, you can always adjust your ambition. And it’s wise that you have an idea of relevant partners needed for authorization and support. 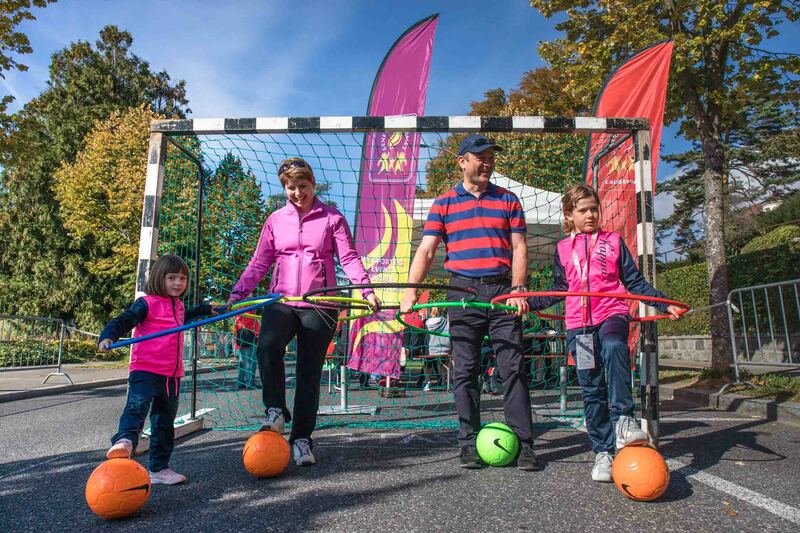 Generation Games editions take place in the city center. It’s a perfect urban playground! So, choose a fun location in the city, a popular spot for the locals. You probably know best which locations in your city are ideal for the Generation Games. This could be a lively square, some streets and sidewalks, or a park in the city center. 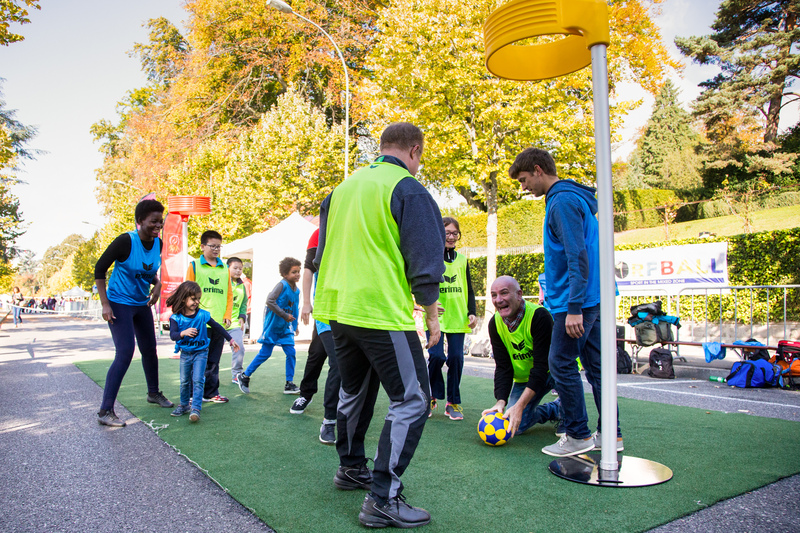 The teams can participate in various sports, walking along a circuit in the city center. 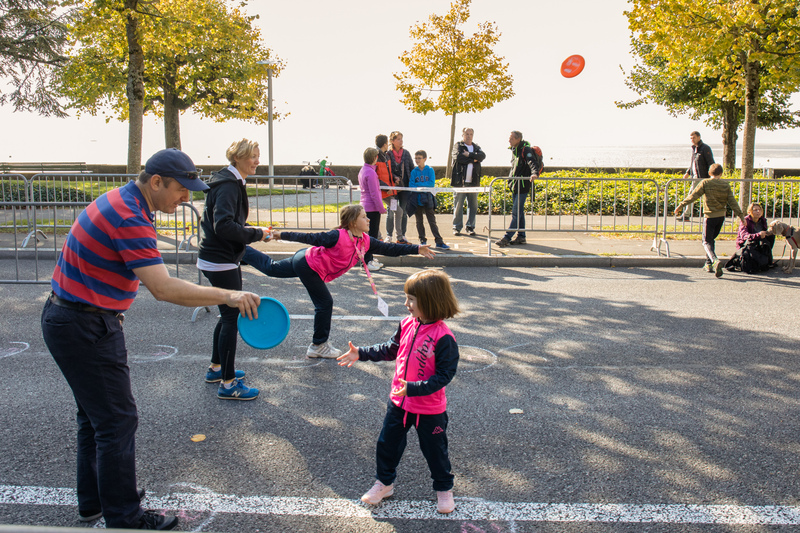 Having the event in the heart of the city, in a vibrant area, is great fun for the participants themselves and also for spectators. You will also have people that can try out some sports spontaneously. 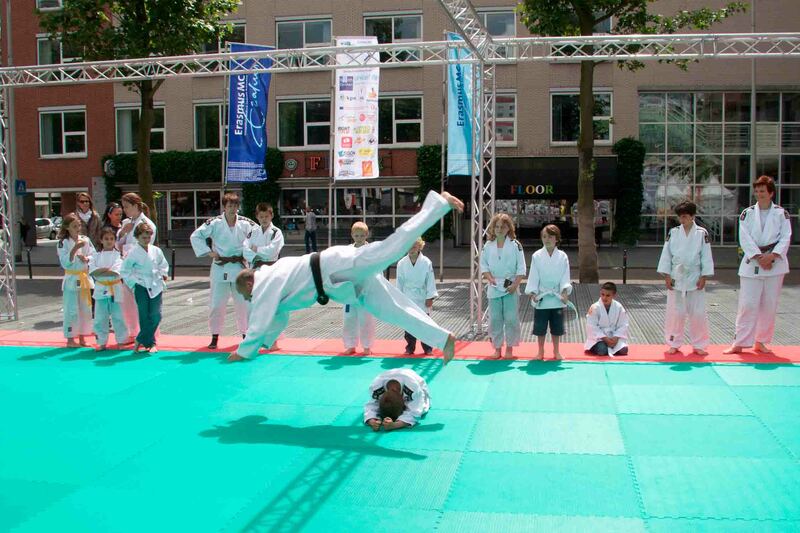 And a sport for all event in the city center is good city promotion as well! Make sure you have enough room for the sports activities and for the number of people taking part in the event. For some activities you need more space than for others. The location should not be too small (too crowded) or too large (a huge square with small group of participants is not good ambiance). This also relates to the number of sports you offer, the space between each activity. As shared under 1. AMBITION, for some locations, you will need formal authorization. So, please involve the local officials. 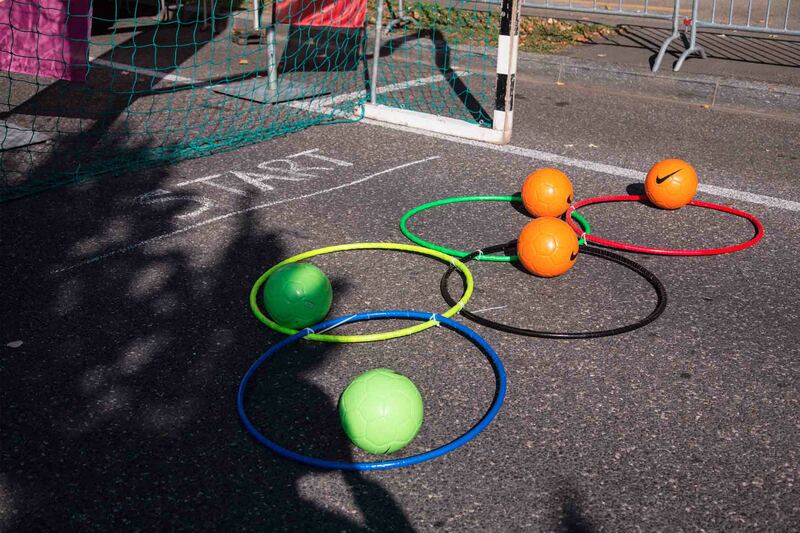 School editions of the Generation Games take place around the school yard. Schools probably don’t need formal authorization and can decide themselves. The surface should be all right for the sports: flat and smooth, not too many obstacles around. Some sports, you can do at any underground. For others, you might prefer grass. You can also think of a mix of surfaces. 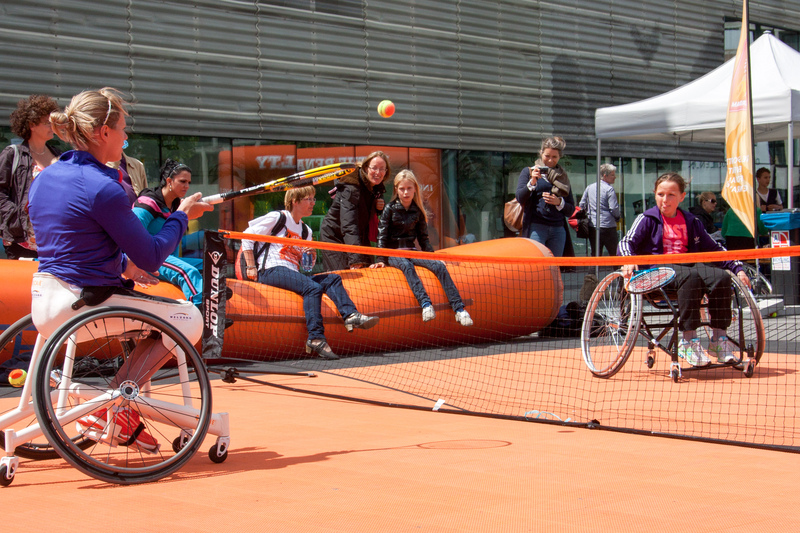 The location should ideally be accessible for people with a handicap, like participants in a wheelchair. You can choose any day of the year to organize your Generation Games edition. The event date is up to you. We advise you to set a preliminary date as soon as possible. So you can work towards this date. In case you can’t choose the date yet, it’s good to choose a certain period (month and year), while preparing the event. Please keep in mind that you will need about 4-5 months preparation time. Preparation time also depends on the scale and the decision making process in your city. The edition itself can be set up quickly, with the right partners in the city. Since the event is outdoors, please think of the weather conditions in your city. What would be a good period of the year for your city? A 1-day edition of the Generation Games is perfect! Most cities organize the event during 1 day. If you prefer the Generation Games to last for 2 or even more days, that’s possible as well. In case of more days, you need to arrange a bit more: storing materials overnight, more volunteers for example. You could connect your event with a certain day of the year, like 23 June (International Olympic Day) or 1 October (International Day of Older Persons). But again: you have choose any day of the year! 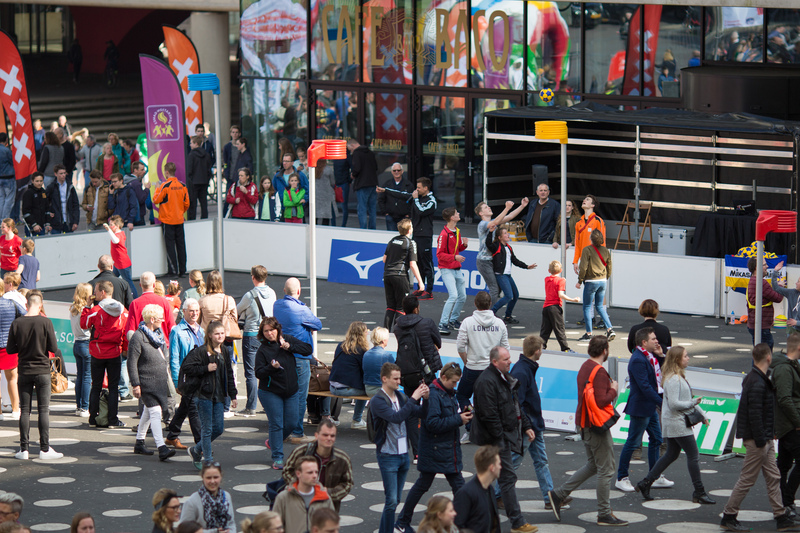 Choose a day during the weekend, if you want to attract many teams and a good crowd. 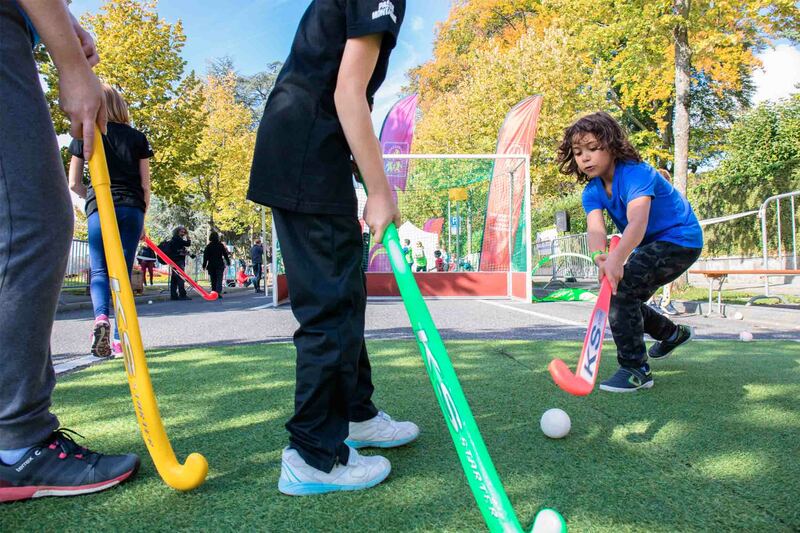 You can offer any sport during the Generation Games. As long as the activity is fun and suitable for people of all ages. Regardless fitness level and how experienced. Below, we share some suggestions about the kind of sports and the number of sports. You can think of a mix of popular, well-known sports and activities and sports most people are less familiar with. A mix of Olympic and non-Olympic sports. t’s your party: you choose the kind of sports, and the number of sports. It can be tennis, soccer, hockey, disc-golf, volleyball, korfball, archery, rowing, basketball, judo, chess, and so forth. You decide! TIP: you can think of a mix of popular, well-known sports and activities and sports most people are less familiar with. A mix of Olympic and non-Olympic sports. 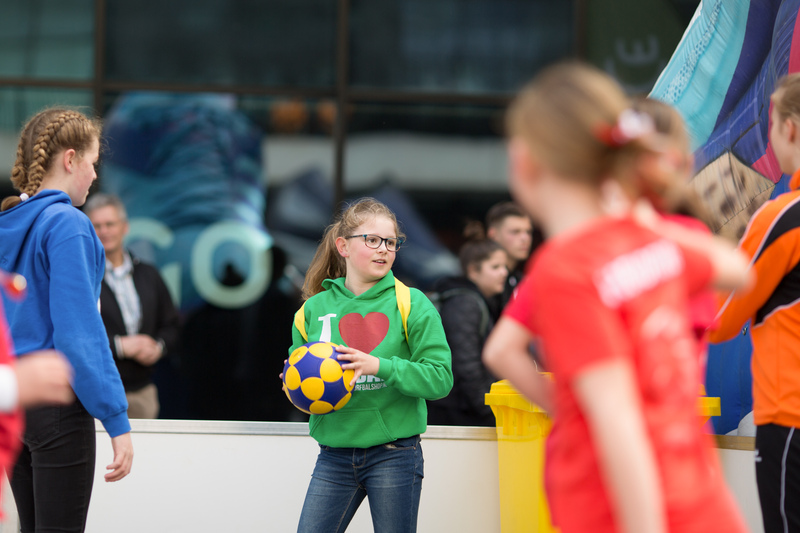 The Generation Games is a multi-sports event. So, it’s good that you offer around 10-15 sports activities. More sports is possible, that’s up to you. 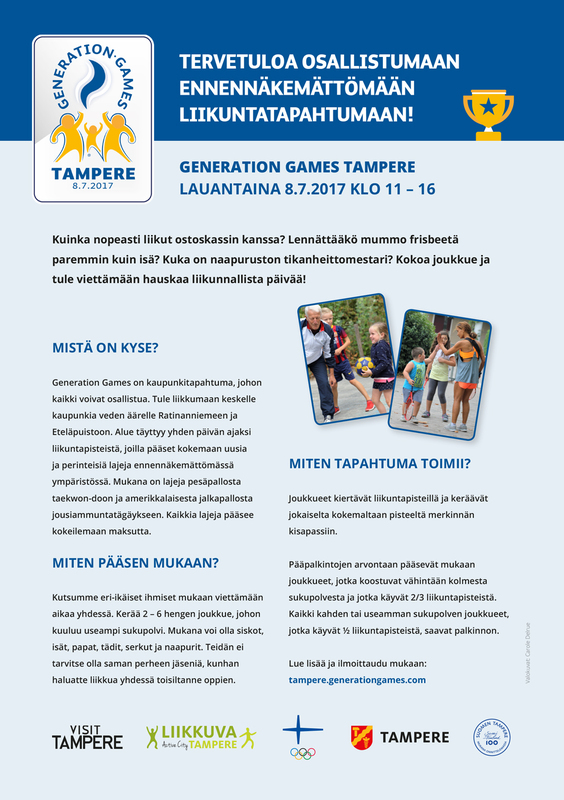 Generation Games Tampere, 8 July 2017, offered over 25 sports activities. 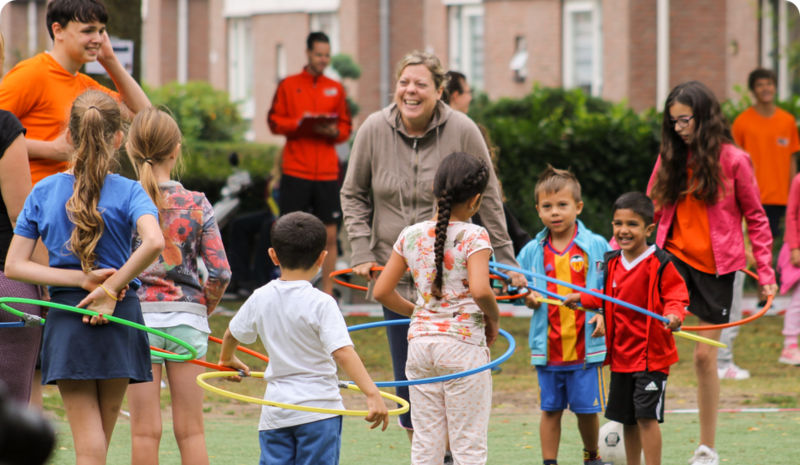 The sports activities should underline the intergenerational philosophy: collaboration, learning, and passing on. So, all the team players should be involved. 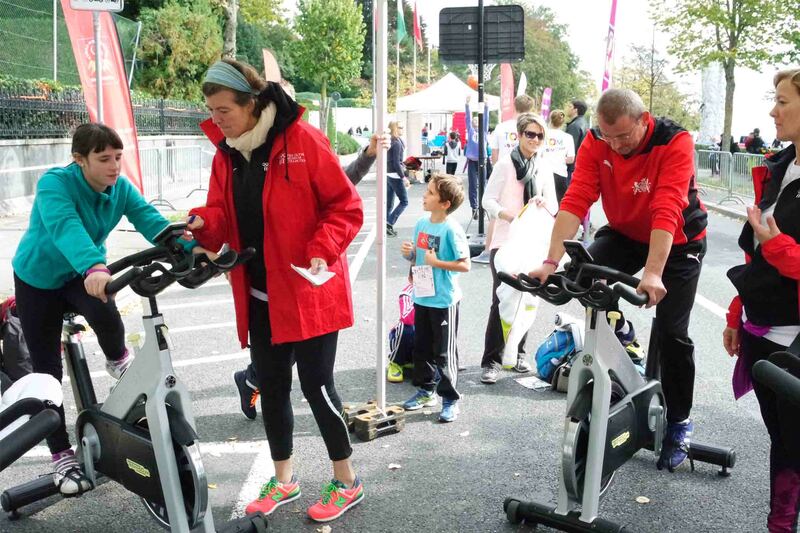 Participants of all levels of fitness and abilities should feel comfortable in participating. Each sports activity lasts about 10 minutes, on average. Some a bit shorter, some a bit longer. There should be some time-limit built in. After completing one sport, the generation team moves on to their next activity. TIP: in preparing the event, write down for each sport what is needed materials, location, perhaps electricity, kind of surface. We can send you an Excel sheet with the relevant categories. 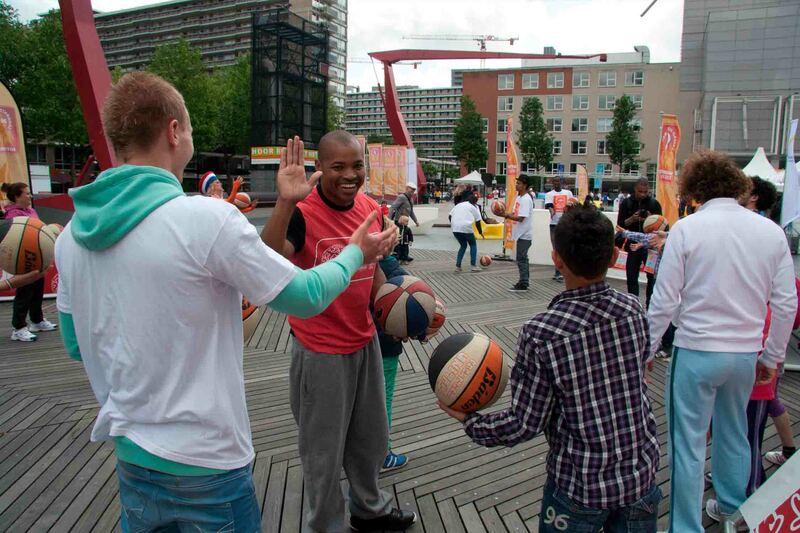 The sports are accompanied by volunteers, for example by the local sports clubs or students. Make sure you have enough volunteers to accompany the generation teams. Please also see under 5. COORDINATION & PARTNERS. Each team receives a scorecard: the results per activity are written down. Please check the toolkit for the scorecard design. The activity should not be too challenging or dangerous. You don’t want injuries! We advise you to offer activities for each team, as an individual team effort. For some activities, you can consider some matches between teams. As described under 2. THE LOCATION: the surface needs to be smooth for some sports. For others, the underground is of less importance. Please check if the location you have chosen or in mind, will provide a good surface. Next to sports activities, consider offering some fun additional activities. Please also check the Questions & Answers (e.g. 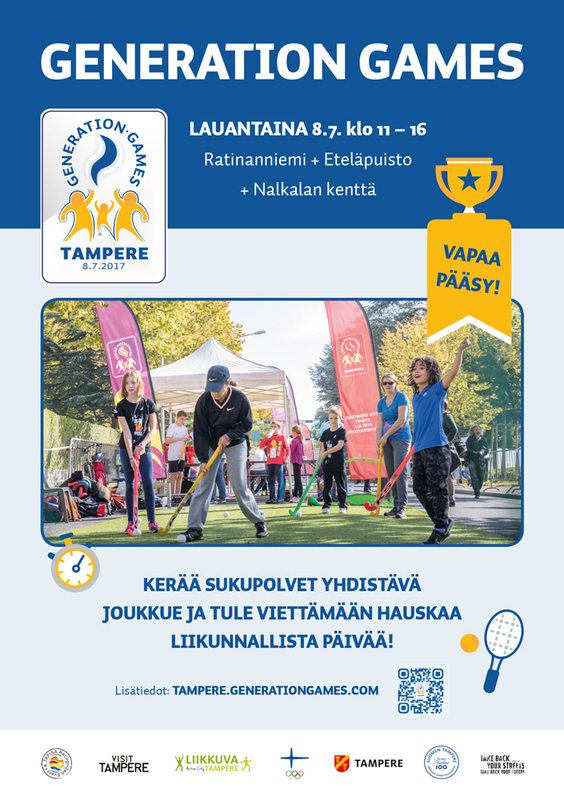 relay batons project, and the Generation Games Sport Quiz). 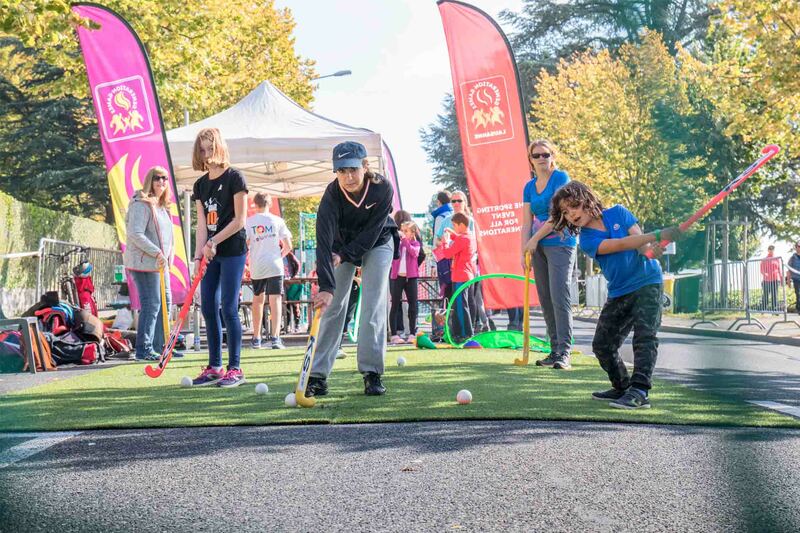 You could offer some demos and clinics, by local heroes, perhaps even national athletes (Olympians/ Paralympians) of all ages. Our experience: these side-events are really appreciated! It’s fun and purposeful to prepare and realize the Generation Games together. Involving organizations, networks and people of all ages and backgrounds. Many hands make light work. Because of the many people involved, the event needs good coordination. And by involving partners, you can keep your budget very low. Below you find suggestions. Make an estimate of out-of-pocket costs, ‘inevitable costs’, the basics and the extras: what can partners contribute (volunteers, materials, and perhaps also with money). Each Generation Games edition is the result of teamwork. 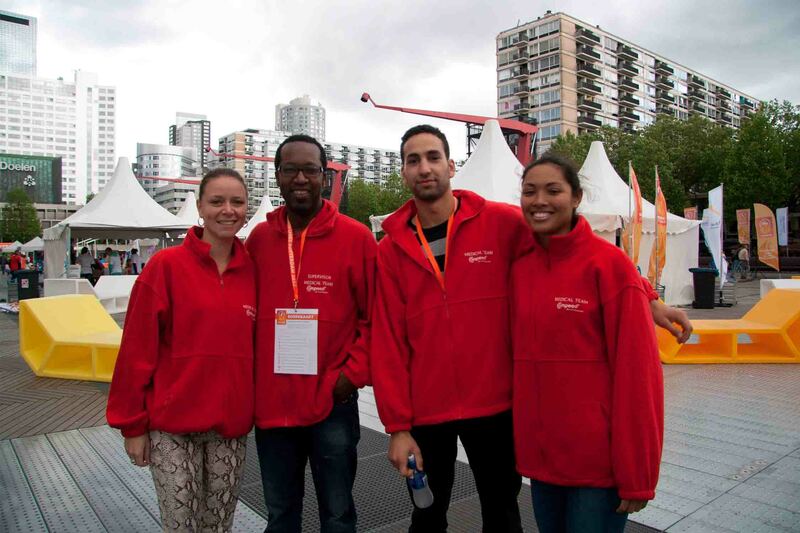 Involve volunteers for event management, communication, hospitality, photography, and many other activities. Involve the Mayor’s office, Universities, networks of older persons, sports organizations, your National Olympic Committee, you name it! One person will coordinate the event, the ‘local coordinator’. Coordination can of course also be done by 2 or more people, as long as roles and responsibilities are clear. The city can decide who plays this coordinating role. A civil servant, someone working for the sport for all organization, the University (sport management students), and so forth. TIP: involve national and international sports federations as well. For support, for (communication) materials, for clinics by athletes, and so forth. 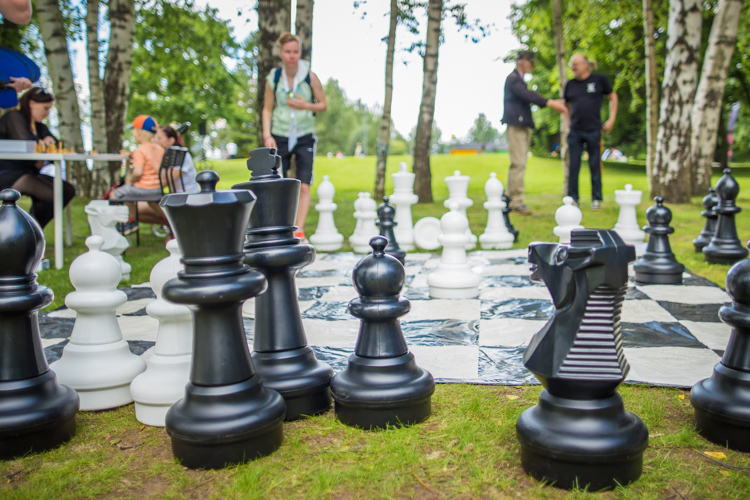 Several universities around the world play a role during the Generation Games. We strongly advise you to connect with your Universities and schools! You provide great learning opportunities, and the students can play several roles as volunteer. Partners can contribute with all kinds of expertise, materials, volunteers, and so forth: you know best which organizations and networks to involve. TIP: make an estimate of out-of-pocket costs, ‘inevitable costs’, what are the basics, what are the extras: what can partners contribute (volunteers, materials, and perhaps also with money). Perhaps, the city administration, the municipality can support financially, but because it’s a budget low event, this is often not even necessary. It’s possible to organize the event with a very low budget. Focus on partnerships: it’s not money that you need, but commitment, volunteers, sports materials, and so forth: who can contribute in kind? Who is willing to be part and contribute to the success? Sports clubs, sports federations can supply sports equipment and can arrange volunteers. Several international sports federations will be happy to support. Local partners can supply food and drinks, print materials (needed for score card, banners) might be willing to give a discount, or for free, in return for some publicity. Arranging the sports materials: make an inventory per sport, what is needed. For instance goals, balls, baskets, whistles, chalk to put on the streets, and so forth. Local sports clubs and other partners will be able to deliver most of the materials; materials don’t need to be expensive and very sophisticated! You can use simple materials and create a fun activity. It’s a do-it-yourself event. Easy to set up, in any city, by anyone. And if you have a question, please ask! Good promotion is crucial! Everyone in the city should know about the upcoming Generation Games event. Make a good communication plan, to get the event under the attention of the community and to have many enthusiastic participants! Start promoting the event at least 6-8 weeks before event-date, invite the community to form a team. Develop you promotional and communication materials in time: please don’t start too late. Please do not underestimate this. It’s vital for the success of your event. Start promoting the event in time! Especially for a first time edition in your city. People do not know about the event, so you need good, effective communication to draw attention and getting them to participate. Please do not underestimate this aspect! A good crowd is crucial for the success of your event! Each city knows best how to connect with the locals, and which tools to use (flyers, social media, and so forth). Use many communication channels: social media, articles in the local newspaper, distribute promotional flyers at schools, and so forth. TIP: all the partners involved in the event can use their communication channels to promote the event. 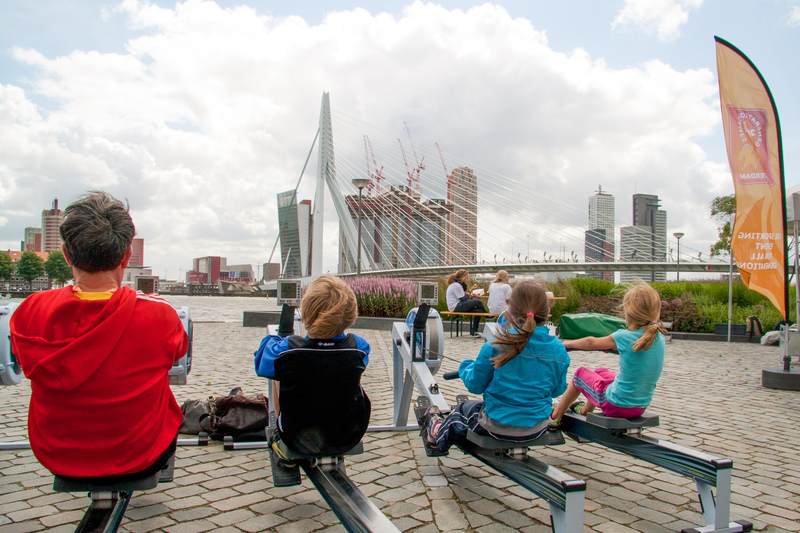 Collaborate with partners in promoting the event: schools, sports clubs, volunteer networks: no cost, high impact. Also make use of existing Generation Games social media. Make sure you have a good indication of the number of people and teams attending the event. You can use an on-line subscription page (Google Forms format). In any edition around the world, the city makes use of ready-to-use designs. The colors for each edition will be different, but style and look & feel are the same. The local editions are part of a large international ‘family’, each edition with a specific character. The designs underline this. You can always share your designs with us, we will have a look and perhaps give some suggestions. You can also think of t-shirts for the volunteers, silicone bracelets, that’s up to you. 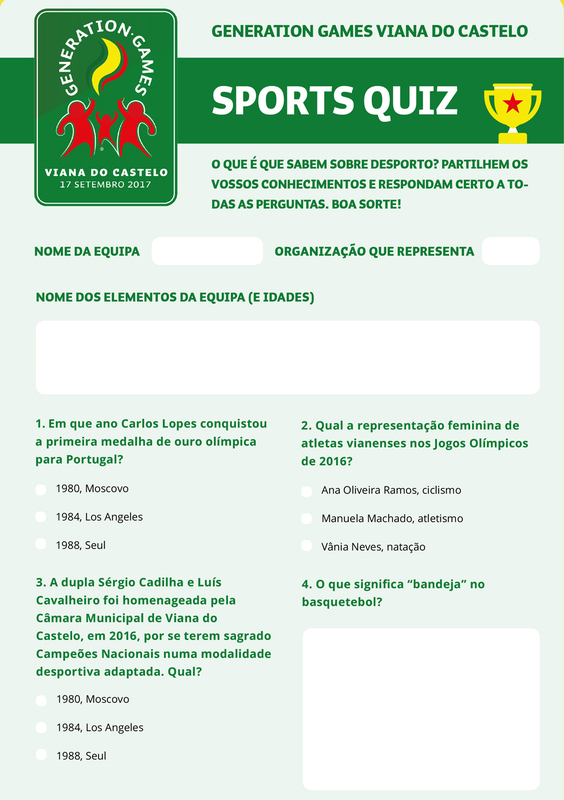 The diploma: since every participant is a ‘winner’, we suggest that by completing all of the sports, the team members receive this certificate. You can of course also choose for a medal. In the digital toolkit, you find designs for your logo, scorecard, banner, diploma, the Sports Quiz. Please print the materials in time. The designs in the toolkit: to make it easy for you, and to have some consistency in design, some elements are fixed, you can add your texts and photos. 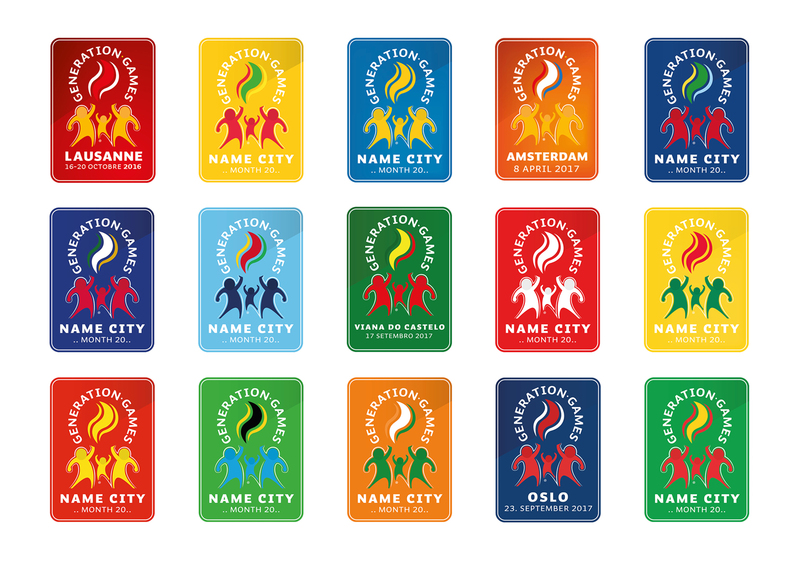 For the 193 UN member countries a logo is made, based on the colors of the country flag. Simply put in your city name and event-date. TIP: you can always share your designs with us, we will have a look and perhaps give some suggestions. The actual Generation Games event is the result of preparations by several people and organizations. 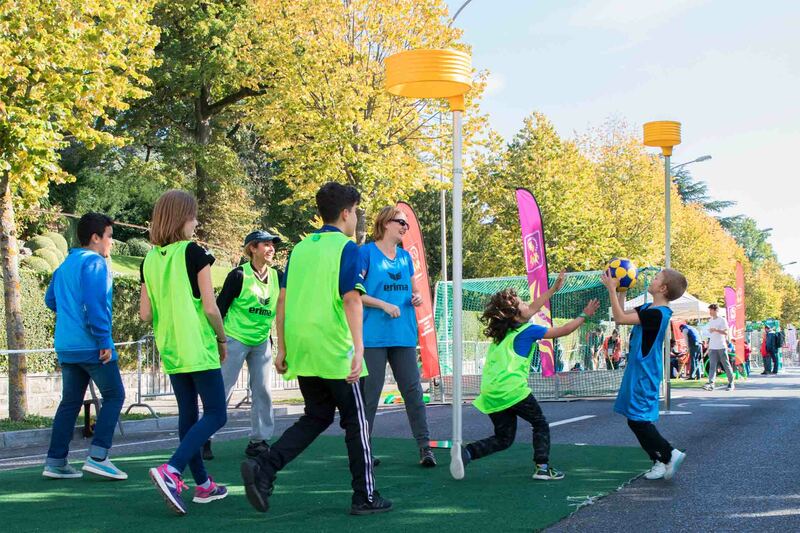 Your city probably knows what it takes to organize a sport for all event. Like a good script for the event-day, bad weather scenario, have some fruit/water, perhaps some mobile toilets. And other relevant aspects. Don’t forget: organizing a sporting event always causes some stress, but try to enjoy the process and the event as well! ☺. We kindly ask you to inform us, when you decide to organize an edition. And afterwards, also please inform us about the results and share the evaluation. So we can improve the event. And we love to receive the photos of your edition! Other cities will be inspired as well! We wish you lots of success and fun preparing your Generation Games edition..
MORE THAN HAPPY TO SUPPORT!